For others with the same name, see Charles Whittlesey (disambiguation). 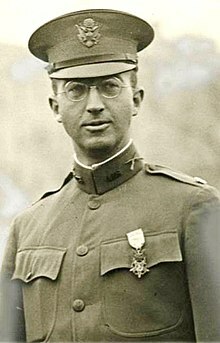 Charles White Whittlesey (January 20, 1884 – presumed dead November 26, 1921) was a United States Army officer and an American Medal of Honor recipient who led the "Lost Battalion" during the Meuse-Argonne Offensive in October 1918 during the final stages of World War I. Three years after the war's conclusion, Whittlesey mysteriously disappeared in November 1921 while at sea. Whittlesey was born in Florence, Wisconsin, where his father worked as a logger, and he attended school in Green Bay, Wisconsin. 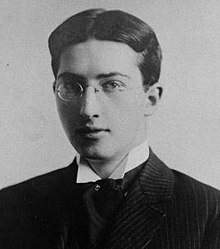 He moved with his family in 1894 to Pittsfield, Massachusetts, where he graduated from Pittsfield High School in the class of 1901. He enrolled at Williams College, where he was a member of St. Anthony Hall, graduating in 1905. He was voted the "third-brightest man" in his class, and because of his aristocratic manner was nicknamed "Count." He earned a law degree from Harvard Law School in 1908. Soon after graduating he formed a law partnership with his Williams classmate J. Bayard Pruyn in New York City. Influenced by his friend and roommate at Williams, Max Eastman, Whittlesey spent several years as a member of the American Socialist Party before resigning his membership in disgust over what he viewed as the movement's increasing extremism. In May 1917, a month after the American entry into World War I, Whittlesey took a leave from his partnership and joined the U.S. Army. He shipped for the Western Front as a captain in the 308th Infantry Regiment, 154th Infantry Brigade, part of the 77th Infantry Division. The 77th was known as the "Metropolitan Division," because it was made up largely of New York City men, principally from the polyglot Lower East side. Its members spoke 42 different languages or dialects. By September 1917 Whittlesey was commissioned a major. On the morning of October 2, 1918, the 77th Division was ordered to move forward against a heavily fortified German line as part of a massive American attack in the Meuse-Argonne region. Whittlesey commanded a mixed battalion of 554 soldiers, who advanced forward through a ravine. Because the units on their flanks failed to make headway, Whittlesey's troops were cut off from their supply lines, pinned down by German fire from the surrounding 200-foot (61 m) high bluffs. The following days were perilous for Whittlesey and his men, as they were without food or water. Some of the men had never thrown a live grenade, but for four days, they resisted snipers and attacks by waves of German troops armed with hand grenades, and in one incident, flame throwers. During this period war correspondents seized on the incident and dubbed the unit the "Lost Battalion." The suffering of your wounded men can be heard over here in the German lines, and we are appealing to your humane sentiments to stop. A white flag shown by one of your men will tell us that you agree with these conditions. Please treat Private Lowell R. Hollingshead [the bearer] as an honorable man. He is quite a soldier. We envy you. The German commanding officer. Whittlesey's alleged reply was "You go to hell! ", although he later denied saying it, stating a response wasn't necessary. He ordered white sheets that had been placed as signals for Allied aircraft to drop supplies to be pulled in so they would not be mistaken for surrender signals. That night, a relief force arrived and the Germans retreated. Of the original 554 troops involved in the advance, 107 had been killed, 63 were missing and 190 were wounded. Only 194 were able to walk out of the ravine. Rank and organization: Major, U.S. Army, 1st Battalion, 308th Infantry, 77th Division. Place and date: At Charlevaux, Binarville, Argonne Forest, France; 2–7 October 1918. Entered service at: Pittsfield, Massachusetts. Birth: January 20, 1884; Florence, Wisconsin. General Orders: War Department, General Orders No. 118, December 2, 1918. Although cut off for five days from the remainder of his division, Major Whittlesey maintained his position, which he had reached under orders received for an advance, and held his command, consisting originally of 46 officers and men of the 308th Infantry and of Company K of the 307th Infantry, together in the face of superior numbers of the enemy during the five days. Major Whittlesey and his command were thus cut off, and no rations or other supplies reached him, in spite of determined efforts which were made by his division. On the 4th day Major Whittlesey received from the enemy a written proposition to surrender, which he treated with contempt, although he was at the time out of rations and had suffered a loss of about 50 percent in killed and wounded of his command and was surrounded by the enemy. Monument to the Lost Battalion in the Argonne Forest, France. The story of the Lost Battalion was one of the most talked about events of World War I. In 1919, the events were made into a movie. He tried to return to his career, working as an attorney at the Wall Street firm of White & Case, but found himself in constant demand for speeches, parades, and honorary degrees. The pressure wore on him; he said to a friend: "Not a day goes by but I hear from some of my old outfit, usually about some sorrow or misfortune. I cannot bear it much more." In November 1921, Whittlesey acted as a pallbearer at the burial of the Unknown Soldier at Arlington National Cemetery, along with fellow Medal of Honor recipients Samuel Woodfill and Alvin York. A few days later he booked passage from New York to Havana aboard the SS Toloa, a United Fruit Company ship. On November 26, 1921, the first night out of New York, he dined with the captain and left the smoking room at 11:15 p.m. stating he was retiring for the evening, and it was noted by the captain that he was in good spirits. Whittlesey was never seen again. He is presumed to have jumped overboard; his body was never recovered. Before leaving New York, he prepared a will leaving his property to his mother. He also left a series of letters in his cabin addressed to relatives and friends. The letters were addressed to his parents, his brothers Elisha and Melzar, his uncle Granville Whittlesey, and to his friends George McMurtry, J. Bayard Pruyn, Robert Forsyth Little and Herman Livingston, Jr. Also in his cabin was found a note to the captain of the Toloa leaving instructions for the disposition of the baggage left in his stateroom. He left the famous German letter asking for surrender to McMurtry. Whittlesey's cenotaph is in a cemetery in Pittsfield, Massachusetts. It notes that his body was never recovered. In 1948, the Charles White Whittlesey Room was dedicated at the Williams Club in New York City. In 2001, U.S. television channel A&E made a television movie called The Lost Battalion based on accounts of the battle. In that portrayal Major Whittlesey was played by Ricky Schroder. ^ "'Lost Battalion' Hero Former Green Bay Boy". The Post-Crescent. December 1, 1921. p. 6. Retrieved July 31, 2016 – via Newspapers.com. ^ a b c d "Charles Whittlesey: Commander of the Lost Battalion". The Great War Society. 2000. Retrieved 2006-09-07. ^ L. Wardlaw Miles (1927). "Citations Awarded to the 308th Infantry". History of the 308th Infantry, 1917-1919. New York: Putnam. ^ Beautiful War: Studies in Dreadful Fascination by Philip D. Beidler=2016. University of Alabama Press. p. 109. Retrieved October 25, 2017. ^ Picture of Whittlesey's military decorations in the College Archives and Special Collections, Williams College, as seen in the article "Lost Again: Echoes of a WWI Hero's Suicide", The Berkshire Eagle=May 26, 2017. The Berkshire Eagle, Pittsfield, Massachusetts. Retrieved October 25, 2017. ^ "Wings of Valor: The Lost Battalion in the Argonne Forest". C. Douglass Turner. Archived from the original on 2006-03-26. Retrieved 2008-02-20. ^ Parrish, Melvin M. (August 26, 1980). "Florence Native Commanded Famed Lost Battalion in World War I". Florence Mining News. p. 26. Retrieved September 7, 2007. ^ "Walter Frankl, Portrait of Colonel Charles White Whittlesey". The Williams Club of New York. 1998. Archived from the original on 2007-09-28. Retrieved 2007-09-07. ^ See credits for The Lost Battalion on IMDb . "Charles White Whittlesey". Claim to Fame: Medal of Honor recipients. Find a Grave. Retrieved December 7, 2007. "Sought Whittlesey half day in midsea; Search Will Make Fruit Liner Toloa Late Reaching Havana" (pdf). The New York Times. November 30, 1921. p. 5. Slotkin, Richard (2005). Lost Battalions; The Great War and the Crisis of American Nationality. New York: H. Holt. ISBN 0-8050-4124-9. OCLC 8975902. Whittlesey, Charles W. and George G. McMurtry. "The Epic of the Lost Battalion". The New York Times, September 30, 1928. "Charles White Whittlesey, Medal of Honor recipient". World War I. United States Army Center of Military History. June 8, 2009. Retrieved December 7, 2007. "Whittlesey biography". Retrieved September 27, 2010.